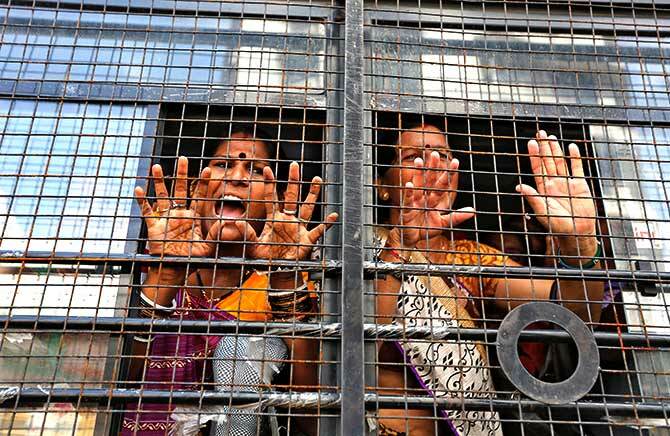 Image: Women react from inside a police vehicle after their detention during a protest rally, as part of a nationwide strike, in Ahmedabad. ' Photograph: Amit Dave/Reuters. 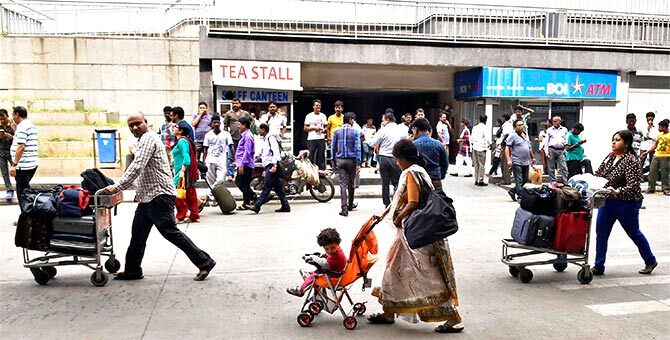 Normal life in various parts of the country was partly affected, on Friday, by the one-day nationwide strike by trade unions with banking, transport and coal mining being among the most impacted, while hundreds of workers were detained in Haryana, Jharkhand and West Bengal. While some states like Kerala and Telangana were badly hit by the strike, the impact was partial in Punjab, Haryana and Maharashtra. However, life remained normal in metropolitan cities of Mumbai and Delhi. 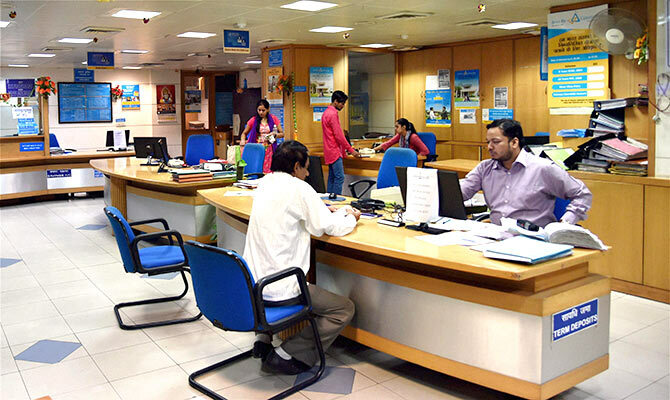 Banking services have been affected throughout the country as public sector banks' employees largely remained off-duty. Private banks, however, continued their operations normally. Clearing operations at Reserve Bank were hit with trade union leaders claiming that cheques totalling Rs 19,000 crore (Rs 190 billion) were held up as the staff did not report on duty. "Clearing services have been impacted. Financial instrument worth Rs 19,000 crore has been held up," claimed AIBEA general secretary C H Venkatachalam. All India Coal Workers Federation general secretary (CITU) D D Ramanadan said, "Dispatch, production and transport of coal have come to a standstill with operations in CIL subsidiaries BCCL, CCL, ECL and CMPDI badly hit. Around 300 workers have been arrested in Rajmahal and Chitra mines areas." "There have been instances of arrests in West Bengal and Haryana. We came to know that 12 people have been arrested in Manesar while seven were detained in West Bengal. The strike this time has greater impact than last year's agitation on September 2," All India Trade Union Congress secretary D L Sachdev told PTI. He said, "Buses of Punjab Roadways and Haryana Roadways were almost off the road. More than half the buses of Uttar Pradesh Road Transport were also off the road. But DTC's buses were plying while Delhi Metro was also functional." The strike is almost complete in Left-ruled Kerala where it got the support of Chief Minister Pinarayi Vijayan who courted controversy after supporting the strike on Facebook with BJP hitting out against him. 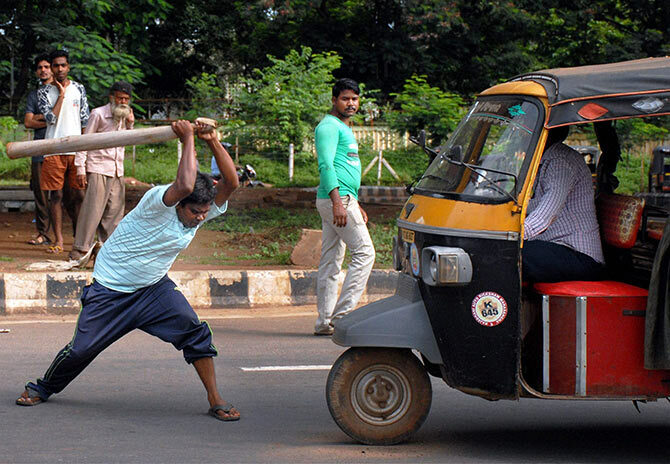 Image: A protester halts an auto during All India Strike called by Left parties and Trade unions in Bhubaneswar. ' Photograph: PTI Photo. Public transport vehicles in Kerala stayed off the roads and shops and business establishments downed shutters. Auto rickshaws, taxis, Kerala State Road Transport Corporation (KSRTC) and private buses were not plying across the state with the workers of various unions taking part in the strike, reports received here from districts said. Major roads wore a deserted look in the state capital of Thiruvananthapuram where hundreds of employees of ISRO units, including Vikram Sarabhai Space Centre (VSSC), could not reach their offices as agitators laid siege to an ISRO bus bay in Thiruvananthapuram. In Telangana, banking operations came to a standstill with over 15,000 employees belonging to various banks participating in the general strike. AIBEA joint secretary B S Rambabu said demonstrations will be held in all the district headquarters along with other trade unions. "Most of the buses run by Telangana State Road Transport Organisation are kept off the roads," a senior Telangana State Road Transport Corporation official said. As many as two lakh state government employees (gazetted, non-gazetted and class 4) are supporting the strike, Telangana Gazetted officers Association general secretary A Satyanarayana said. Work was also affected in PSUs like Vizag Steel Plant, Bharat Heavy Plate and Vessels Ltd, Hindustan Shipyard, NTPC's Simhadri Power Plant, Visakhapatnam Port Trust and private industrial units in Visakhapatnam as many of the workers joined the strike. Image: Flight passengers face transport difficulties at NSCBI Airport in Kolkata during the nationwide bandh called by trade unions on Friday. ' Photograph: Ashok Bhaumik/PTI Photo. Services including banking and public transport were hit in Haryana, Punjab and UT of Chandigarh with employees of various government departments joining the day-long nationwide strike. Public transport services were hit in Punjab and Haryana with roadways employees participating in the strike, causing inconvenience to passengers. Punjab Roadways employees said they will remain on strike from 10 am to 2 pm. Buses were seen parked inside the main Bus stand opposite National highway-I. Around 2,000 nurses stayed away from work following All India Government Nurses Federation's call to join the strike. Normal life was disrupted in most parts of Odisha too. Train services were affected following 'rail roko' by agitators who squatted on the tracks at several places including Bhubaneswar, Cuttack, Berhampur, Sambalpur, Bhadrak, Balasore, Jaleswar, Keonjhargarh and Rayagada, police said. 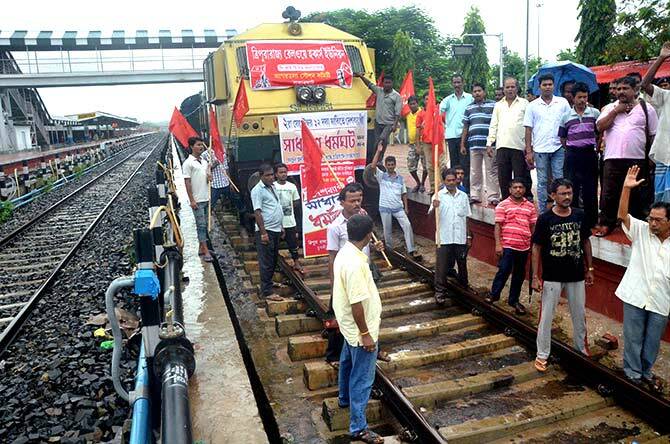 Image: Protesters on railway tracks during a nationwide strike called by trade unions against the central government in Agartala. ' Photograph: PTI Photo. Vehicular movement virtually came to a grinding halt with buses, trucks, auto-rickshaws and other vehicles keeping off the roads as agitators held road blockades at many places including highways and burnt tyres and put hurdles, police added. In Bihar, normal life was affected with autorickshaw and other public vehicles staying off the roads while banks remained closed. Banks in major cities like Patna, Munger, Bhagalpur, Hajipur, Muzaffarpur, Purnia, Chhapra, Arrah, Biharsharif, Katihar, Begusarai, Samastipur and Gopalganj remained closed. Bank employees organised rallies in various parts of the state, B Prasad, president of Bank Employees' Federation, Bihar, said in a statement. NABARD, Regional Rural Banks and Cooperative Banks, also remained closed, he said. 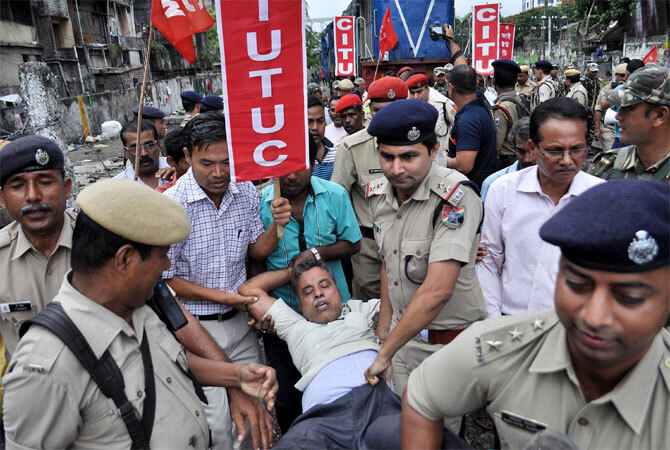 The strike failed to evoke much response in West Bengal. Modest attendance was recorded at various government offices. Image: A view of a Bank during the nationwide strike. ' Photograph: Atuk Yadav/PTI Photo. Government and private buses as well as other private vehicles were seen plying on the road, officials said. Train services of Eastern Railway in Sealdah and Howrah sections, besides Metro Rail services were also normal. However, the rush of passengers was lesser compared to other days. In Karnataka, the strike evoked mixed response. While, state-run buses remained off the roads, office-goers and those traveling to distant places had a harrowing time. Shops, establishments, markets and hotels functioned normally. Though some auto and cab unions had announced their support for the bandh, these vehicles by and large moved normally in Bengaluru. Metro services were also functioning normally. In Tamil Nadu, normal life was largely unaffected. Bus and train services were operated as usual while shops and business establishments remained open. Educational institutions too functioned normally. The ruling AIADMK's labour wing did not participate in the strike. Central government offices wore a deserted look with the employees joining the strike as a section of the state government employees, especially in the revenue department, participated in the strike. Private buses stayed off the roads in Tiruvarur district. The strike evoked a mixed response in Puducherry. Private buses, autos and other passenger vehicles were off the roads while state-run buses were operated as usual. Shops and establishments downed their shutters. Cinema halls suspended shows for the day. It was business as usual for public transport in Mumbai, even as the strike evoked a mixed response in rural Maharashtra. Suburban trains, auto rickshaws, taxis and city buses continued to operate normally, without affecting the daily schedule of lakhs of commuters in Mumbai and suburbs.